While the Sylvans are primarily comprised of forestry students, all majors are welcome to join. 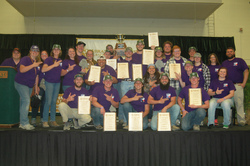 This year's Conclave participants included students from SFA's agriculture, environmental science and nursing programs in addition to forestry. For more information on the Sylvans, contact Dr. Jeremy Stovall at stovalljp@sfasu.edu.